2009 Lionel #14 Holiday Red Mikado Loco, Tender, and Boxcar Set. (QX8602, QX11102, QX11095) - $95.00 : Olson Hobbies, Welcome To The Train Page! 2009 Lionel #14 Holiday Red Mikado Loco, Tender, and Boxcar Set. 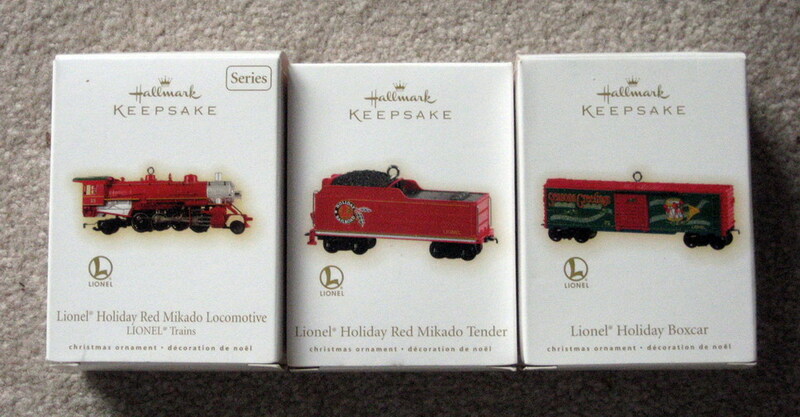 Mint Condition 2009, Lionel Holiday Red Mikado Locomotive, Holiday Red Mikado Tender and Holiday Boxcar. Set comes with Holiday Mikado Locomotive 2-8-2 Steam Engine, stock number QX8602 and Holiday Red Mikado Tender stock number QX11102, and Lionel Holiday Box Car stock number QXI1095. All pieces are handcrafted, wheels turn manually, crafted Die Cast Metal. This was the 14th in a series of Lionel Ornaments that were made.